John has already answered this question. But if i use this with a 3000psi output bottle, will it be safe? and what FPS will i get at 3000psi? Why wouldn't you just use the stock bottle that comes with the gun? Can the tophat be removed for another one ? Yes there are one piece versions to be had. If you read the forums on the Talon-P it will tell which one. I could tell you here but most probably won't be posted? Will it work on a Texan? Not sure if it fits a Texan tank but even if it did you will not have enough pressure to be useful for the weight of large bore pellets. Has anyone tried these (CO2) with a .177 Condor ss? Seems to me this would be a sweet combo for low cost plinking and/or field target. I use with .22 Condor SS, works great for plinking. Will a hpa 3000psi paintball tank work? It's not specifically approved nor disapproved. 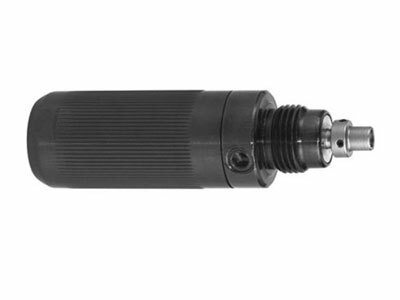 I'm using this adapter on a 48 cubic inch 3000 psi regulated Ninja hpa pain't ball tank. I don't see anything wrong with the combination in that even if you dump the full 3000 psi that is what the gun is designed to shoot. Does this work with the Spin-Loc system on my Condor? Will this work on the AirForceArms Texan? I would say thats about right. Can you put this on the escape ul? Yes still the same frame. Will this work with the new spinloc design? Could u use this to attach say a 68 4500 hpa paintball tank to be able to have more shots? Yes definitely, I'm using 48 ninja 3000 psi hpa regulated tank with this adapter, it's heavy, and now that I know it works may up grade to the carbon fiber. Remember the tank is your stock and my 48 with adapter is the same length as the stock tank, 68 may be to long, also the larger diameter tank requires me to lay my eye against the tank to see through the scope. Easy fix though I just need to get taller rings. This set up on my Condor SS shoots 18 grain JSB exact jumbo heavy diabolo 575 fps. Unfortunately I I do not know the shot count just that its a hella lot more, I only set this up a week ago. Will this work on the Condor SS?